However, it is important that you are persistent in using the language you are learning as much as possible. So rule number one is: Use the language no matter what. Of course it helps greatly to join a Norwegian language course, however, your home and the big Internet offer great resources too. 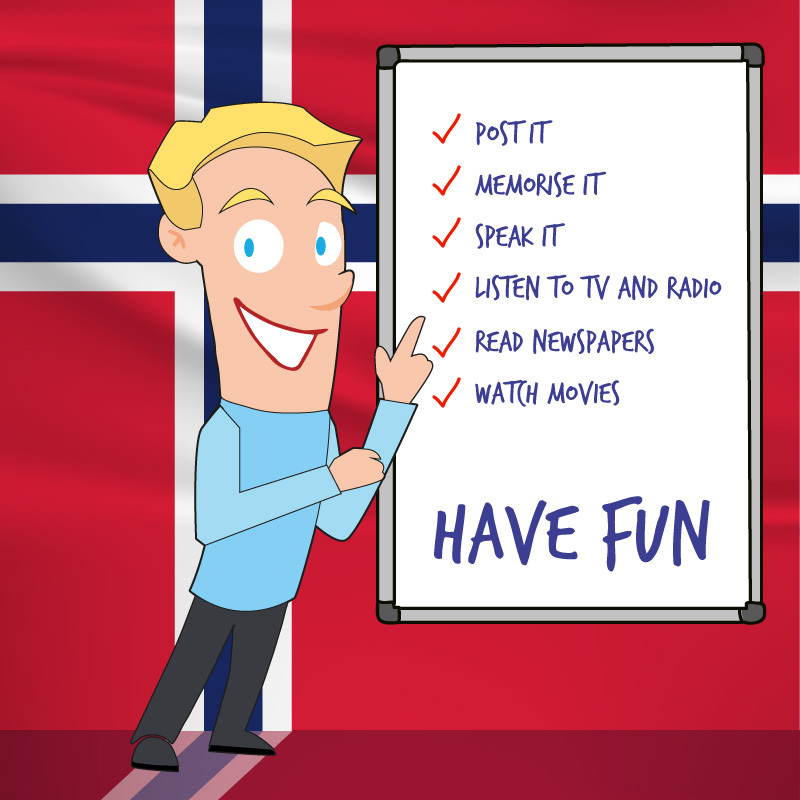 Here are ten more practical tips for how to learn Norwegian fast, both offline and online. Join a language group or café. Learning a language is a social activity. You cannot do it in a vacuum. So why not join a local language group in your area? Practice your pronunciation. Now your friends and colleagues can take a break, because with CALST, your computer turns into an assistant who helps you get a grip of both dialects and pronunciation of words, numbers and much more. Memorise the numbers and pronouns right away. Don’t waste time on learning too advanced vocabulary that you are not likely to use in the beginning. Build vocabulary with Memrise. Focus on words related to your everyday life and your work situation. The more relevant a word is for you, the more likely you are to remember it and start using it. Use simple and fun memory techniques to learn new vocabulary quickly. Try the free version of memolanguage. Ask your friends and colleagues to speak with you in Norwegian, or simply start a conversation in Norwegian. Doing this a few times will tell your colleagues that you are eager to practise your language skills, and most people will want to help you learn Norwegian fast. When you listen to TV or radio, try to listen for the verbs people use. Which inflection is being used? What does the choice of inflection do to the meaning? Reflecting over this will definitely help you internalize more of the language faster. Listen to Norwegian radio while doing other things. Check out NRK’s free stations. Read newspapers in ‘lettnorsk’, ie. easy Norwegian. Check out Klar Tale and Utrop. These newspapers also offer recorded audio and videos in ‘lettnorsk’. Watch Norwegian films with English subtitles. Not only will you be able to pick up rapid Norwegian speech across various dialects, but you will also learn something about the Norwegian culture, history and humour. See our top watch list below. Is there a magic trick to make it easier? Probably not magic, but the key to learning the Norwegian language (and everything else) is to make it fun and relevant and do it consistently. Use the language in as many contexts as possible and you’ll soon be learning Norwegian quickly and with persistence! Good luck and have fun!